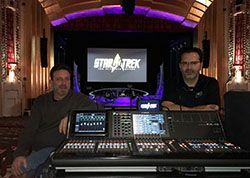 CineConcerts, producers of the Star Trek: The Ultimate Voyage tour, used Specialized Audio Visual, Inc. (SAVI) to provide audio, lighting and visual equipment and technology for each show. Star Trek: The Ultimate Voyage launched their first-ever live concert tour in January. The tour, held at 1,500-8,500 seat venues in more than 100 North American cities, will run through April. Production includes a 33-piece live symphony orchestra, conducted by Justin Freer, which is set to the most iconic Star Trek film with TV footage simultaneously beamed in HD to a 40-foot wide projection screen. New York-based SAVI provided a Yamaha CL5 Digital Audio Console for the front of house mix along with two Rio1608-D boxes and one Rio3028-D input/output box. SAVI also provided video and lighting requirements for the tour including a pair of Christie Roadster HD20K-J projectors, Chroma Q ColorForce 72 LED Fixtures, Martin Mac Viper Profiles, and a GrandMA2 Light for lighting control. “We chose a Yamaha CL5 because of the need for a compact, but powerful, FOH console with a high channel count and the ability to network the entire system on a Dante network,” said Patrick Ostwald, SAVI rental manager. One of the Yamaha Rios is used for video playback to take track inputs, while two more Rios are on the stage for the live stage inputs, according to Ostwald. Auvitran Audio Toolbox units are located in the amplifier racks to provide Dante to AES outputs for the amplifier inputs.